Yonked :: Diary of a New Home: The blue tape is dead, long live the blue tape. For the last year+, we've had no handles on our kitchen cabinets. Instead, we had blue carpenter's tape as pulls. 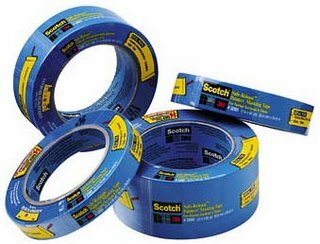 I'm happy to say that as of today, the era of the blue tape is over. The contractor that we talked to last March about coming in and finishing off the kitchen finally arrived, and one of his guys just spent 3 hours installing the pulls. It's not like I didn't offer to do it-- I did repeatedly. But alas and alack, S did not believe in me, and made a mockery of my skills and powers and ability to follow a template on our admittedly expensive cabinets, and as a result, we were of the blue-tape tribe until we could build up enough scratch (and muster enough juice) to compel the contractor to show up. The contractor's doing other stuff as well, including repairing the rickety old basement stairs, installing a third floor hand-rail, finishing the nail holes in the bathroom, moving the light switch of the pantry, and installing new entryways between the kitchen cork floor and the oak floor everywhere else. Oh yes, did I mention fixing the bad kitchen window? So our house is casa construction again, which brings back non-fond memories. Once the guys leave, I'll take photos of their handiwork and may be persuaded to post some. I don't want to do it while they are here-- I've got an effete enough position, working at home on the computer-- taking geeky pictures of our cabinet pulls might push them over the edge into openly mocking my masculinity. Not sure if I can deal with that. Comments on "The blue tape is dead, long live the blue tape." But ALL I kept thinking about in this dream was - but the blue tape - they JUST replaced them with knobs! NOW WHAT!